"We had to do our due diligence and do some research about Jeffrey," Julie said. "But once we saw how he has helped other animals we knew it would be an amazing place." INDIAN TRAIL, N.C. — Hollywood Actor, Jeffrey Dean Morgan Hilarie Burton, have just adopted a pair of rescue animals from Carolina Waterfowl Rescue Center. 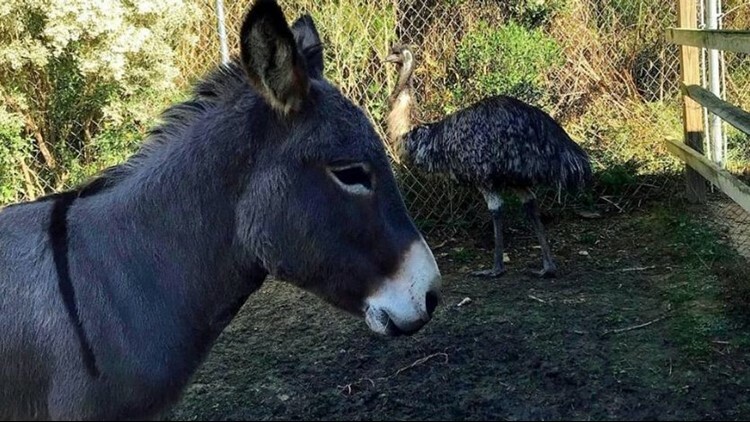 The rescue animals, an emu, and a donkey came as a pair, which means whoever adopted one -- had to adopt the other. Jack and Diane came to the rescue center in Indian Trail and immediately formed quite the bond. In fact, Jack, the donkey, is a bit jealous and protective when it comes to Diane, the emu. Carolina Waterfowl told NBC Charlotte that Jeffrey Dean Morgan had seen all of the media coverage on Jack and Diane and tweeted that he wanted to give them a good home. "At first we said 'wow is this real?" Julie from the Rescue Center said. "But then communication started happening via email." Carolina Waterfowl said they were super excited to get the pair adopted out to a family that would love them as much as they do. According to the rescue center, Jeffrey frequently posts pictures of his farm and animals on social media. "He does post quite a bit on Twitter and we will be able to see what goes on. They're very special," Julie told NBC Charlotte. "We decided to leave in the wee hours so we can get them to their new home before lunch and have some good daylight time for them to get settled. Emus also travel better at night when it's dark. We will be on the road for the next couple of hours while Jack and Diane sleep. They will wake up and be at their new home with Jeffrey Dean Morgan and Hilarie Burton," the rescue center wrote on Facebook.